Government statistics reveal that between January 2011 and November of the same year, 10,600 sick and disabled people people died within six weeks of their benefits having been ended after being wrongly assessed as fit for work by ATOS. 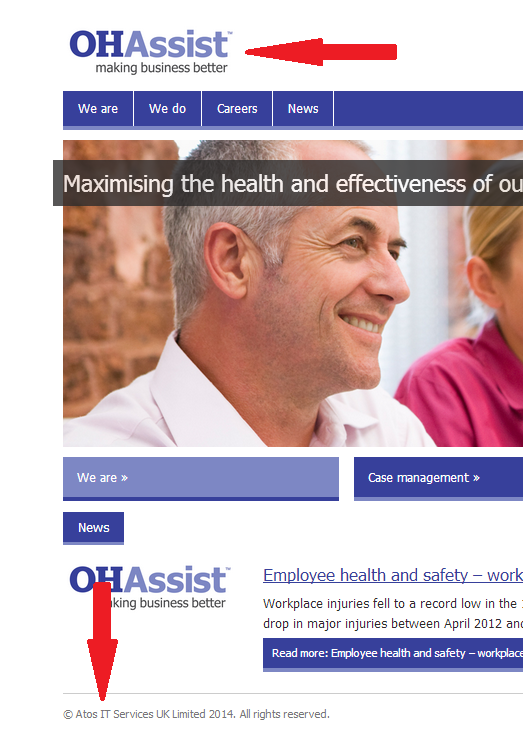 As an example of how toxic the name ATOS has become even to itself – ATOS recently changed its name in the UK to OH Assist as an attempt to distance itself from the scandal. 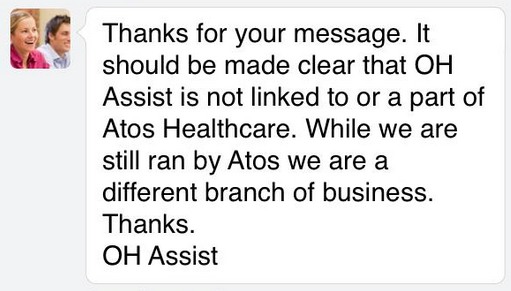 And in a surreal, Kafkaesque comment worthy of the best satirist, OH Assist has taken to denying it is ATOS – while at the same time admitting it is ATOS. Mind you, can’t blame ATOS really. If I’d been responsible for tens of thousands of deaths for the sake of a lucrative contract – I’d want to hide my identity too. Big thanks to ATOS Miracles for the heads up on this. atos no we have never heard of them. Tom – the government statistics you quote are for January to November 2011. I’d like to add my agreement to Trevor Warner’s comment – if it looks like Atos and behaves like Atos, then that’s what it is. I’d surely deny I was ATOS if I was ATOS and caused all that grief and suffering. And why was I reminded of this sketch? assist. All criminals. OH ASSIST. ARE WORSE. COMPLICIT AFTER THE FACT. YOU ARE THE ENEMY OF MY PEOPLE. YOU ARE MY ENEMY. WE WILL END YOU. IN THE UK YOU WILL BECOME EXTINCT. DETACH YOURSELF FROM THIS CRIME THAT IS STILL THE SAME. ONLY THE NAME HAS CHANGED. THE CRIME IS STILL THE SAME. MURDER IS MURDER. EVEN IF THE NAME OF THAT CRIME IS CHANGED MUDER/HOMACIDE. ITS STILL MURDER. Scrapheapchallenge – Excellent. Do you have a blog, Twitter account, facebook etc I can credit you with a link? I’m just astounded. That number: 10,600 – it takes my breath away. How do we stop it? imo the switch is so that they can be in front of the esa claim, and try to block it in the 1st place…..
Well be fair when have they got anything right, so not knowing who they are is not surprising. This reminds me of Unum not being UnumProvident.